We drive out of Toronto on an icy March morning to interview Christine Marshall. The drive is calm and easy. We begin to see drifts of snow alongside the highway as we drive farther out of the city: a message of March in the country that will greet us at Christine's gallery and home in Bala, Ontario. I spend the drive up worrying about meeting Christine - whose reputation as a painter of nature is both extensive and well-deserved - especially as I know so little about painting. Yet when we arrive, the woman who comes out of her house to greet us is kind, and thoughtful: quickly hustling us inside her studio to greet us out of the cold. We make quick introductions and Christine's husband Frank comes to graciously introduce himself and offer us refreshments before heading out on his morning's errands and we begin the interview. It wasn't until Christine's high school days that she ever seriously considered any kind of artistic career. From the first time they met, it must have been obvious to Miss Murphy, York Memorial's art teacher, that Christine held great promise. Likewise, when Christine began high school at York Memorial, she was immediately drawn to this art teacher, and together the two developed a sort of apprenticeship for Christine. Christine would help set up before art class, and was often relied upon to aid others. There were new challenges issued by Miss Murphy - among them, pottery, and art history lessons - which led Christine to incorporate new perspectives and artistic elements in her work, and led to her new interest in art and painting. York Memorial also gave Christine the chance to meet her first husband, Greig Marshall. Greig was what Christine describes as an "extremely bright and energetic young man" who would later become the reason her artistic career took off. Although they had separate and distinct interests and friends in high school, her encounters with him there set the stage for their mutual decision to become teachers. They married soon after high school, then each went on to complete their education at Toronto Teachers' College. After finishing high school and attaining a Fine Arts degree in university, Christine completed her education in teacher's college, where she became reacquainted with Greig Marshall. Together, they began teaching in Toronto. Christine has several reasons for becoming a teacher - among them the fact that it is particularly difficult for a young artist to make her living from her artwork without commercially commissioned work, deadlines, or contracts - but the most important one is that Christine genuinely loves teaching. Indeed, during the interview, she eagerly discusses the idea of having a group of York Memorial art students up to visit her so she can give them a taste of what the future holds for an artist. 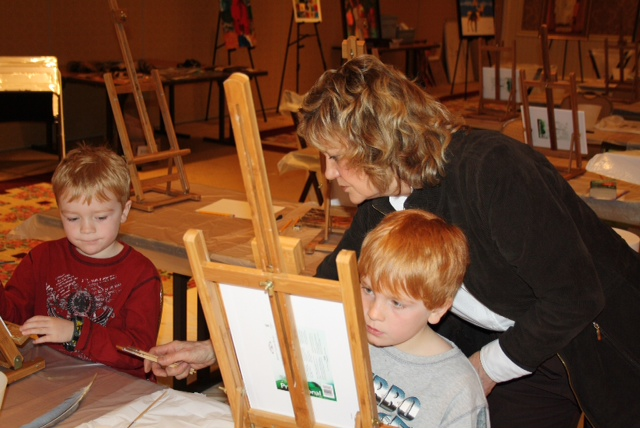 Although she claims to have "gotten teaching out of her system," it is clear that she still enjoys engaging and enlightening groups of future artists. It was while Christine was teaching that she attained an Art Supervisor's Certificate and a Fine Arts Degree at York University in Toronto. For many years, teaching had consumed Christine. She gave all she had to the education of her city's offspring - students from grade school all the way through high school - and their growth into adults. However even as Christine reached the pinnacle of her teaching career, she continued painting on the side, and was often exhausted as a result. Splitting time between two equally consuming, wonderful tasks was grueling, but Christine had no intention of quitting her day job for a career that she was sure could never take off. But one day a neighbour saw one of her earliest mushroom paintings and asked if she would consider selling it. Christine was bemused that someone would wish to buy her artwork, and had no idea of what a fair price for such a piece would be. When she saw the neighbour the next day, she asked if thirty dollars was too much to consider paying for it! Despite her humility - or perhaps because of it - Christine's artistic career took off. She sold one painting after another, exhausting herself physically and mentally until she and her husband took the risk of leaving their teaching positions to pursue and manage Christine's career as an artist. Of course, success came and Christine began to earn commission after commission. With the careful planning and marketing of her now late husband Greig, her career path was set. With each new challenge and subsequent success, Christine's following grew, allowing her the opportunity for travel, mostly within Ontario, but intermittently to places outside the province, and even the country. She traveled to Australia, and Africa, China, and Greece, painting the landscapes and wildernesses she had loved in her childhood. 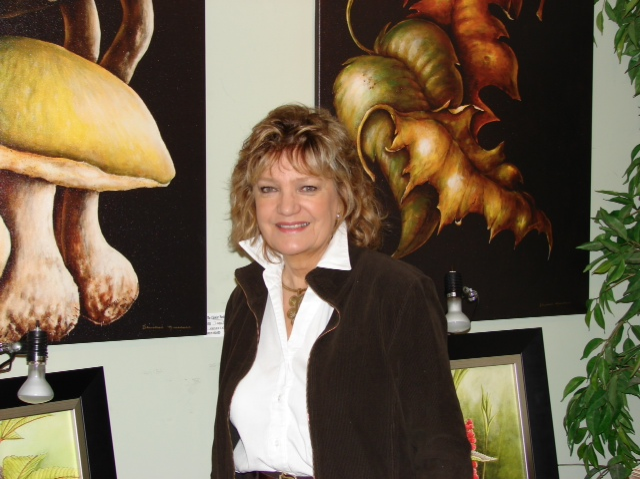 Through the 1980s and '90s the body of work Christine created is impressive both in size and variety of subjects -- from Ontario's birds and wildlife to the majestic animals of the African plains. Her accomplishments brought honours and opportunity. 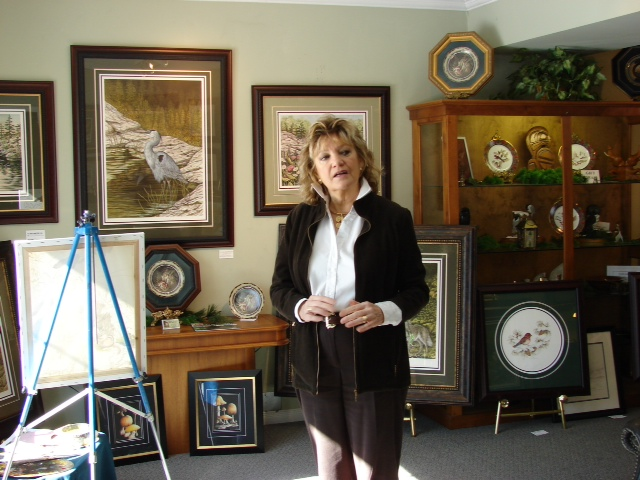 She was named 1994's Ontario Federation of Anglers and Hunters Artist of the Year. She met AJ Casson of the Group of Seven, who later wrote the introduction to a tome published about her life. She attended many events and met numerous other artists and has spent the past 25 years featured at most of the Ontario Resorts as their "Artist in Residence" beginning with her first appearance in Minaki Lodge in 1986. Christine spent a year as Artist-in-Residence at Minaki Lodge, and is still an active member of both the Spring and Fall Art Tours around the Muskoka region of Ontario. Today however, is a quiet day for Christine. As we wrap up the interview and tour, Christine invites us for a lunch she and Frank have prepared ahead of time. They are gracious hosts: engaging us in conversation, offering more food, and allowing us to enjoy the panorama through the windows of their home in the woods. It is easy to be overwhelmed by Christine's success artistically, and awed by where she is today: married to charming Frank, living in an open, welcoming house, and above all, surrounded by this inspiring nature. There are scenes of waterfalls and birds hung on the walls, while outside, the birds fluttering at the feeders inform us of the impending spring, even though the snow hangs off tree branches and crunches beneath our feet as we wave goodbye. For more information, or to contact Christine, please visit her website at: www.wildlifegallery.ca. Christine encourages visits and tours, and would be so happy to see more Memo grads in her studio.